When we bought our home and property in 2017, our home had been well maintained but the property was severely neglected. The original owners we purchased it from had put in fence and a mare motel in order to board horses as a side business. Although we love horses, and plan on leaving some space for horses and our other fur babies, we knew that we did not want to have a horse boarding business. My big dream upon first seeing the property was to put in a permaculture orchard. I am eager to ranch, even on a very small scale. The thought of being surrounded by trees for more privacy on our 5 acres is appealing. A real win-win situation! In our marriage, I am the big picture girl and my husband takes care of the tedious details. It took him a second to see my “vision”, but quickly he got on board. The only question is what are the first steps you need to take in order to put in an orchard, let alone a permaculture orchard? Let me take you on the permaculture orchard prep and ranching ride with us, as it is bound to be a wild, hopefully educational and most importantly goofy ride! For advice, we started talking to some of the local farmers in this area and checked out a ton of books from the library on permaculture designs. The most prolific orchards you see in San Benito County are apricots, walnuts, and occasionally an olive grove. As any good advice would tell you, look at what thrives in the soil already. If other ranchers are investing in these types of crops it means they grow well here. Although we are learning that permaculture harvesting is a little different, having those crops locally means harvesting equipment, advice and resources are easier to come by. Great we thought, we have the resources we need! Let’s do this. We believed for sure we would have our orchard started on our property within the first year. But as with every plan, there are some hurdles. The first hurdle was to cut out and take down all of the fencing the previous owner had put in for boarding horses. On our 5-acre space, the past owner had separate pens for horses to hang. It doesn’t sound too hard to have to remove all of that fencing, but let me tell you. Our soil is very dense and has a thick clay like consistency. There were over 200 posts stuck in the ground, with a few larger posts concreted in. We had to wait until the rainy season to remove these posts. Even using a tractor, the posts were very time consuming and difficult to remove. While we waited out the seasons, we clipped and cut down the wire fencing separating the pens. Again, this is easier said than done, but it felt good clearing out what we didn’t need. Also, a gym membership is not required when working on a ranch, another win in my book! Finally, the rainy season came and we used a post remover to take down the metal fence posts. Next, it was time to remove the railroad tie posts that were secured with concrete. My husband bravely drove the tractor into battle with this one. I am sure he was not too thrilled with my sitting on the back porch giggling while he and the tractor fought the good fight against concrete and wood. But, at the end of a few days, he was able to ride that orange beast in with his head held high, the posts had been removed! In the meantime, we learned that we needed to send in our soil to be tested for nutrient deficiencies. Yup, that’s a thing! I find it all to be super interesting and it makes complete sense. Just like we fertilize our garden with extra nutrients to amend the soil, ranchers have to do this on a large scale to make their crops happy too. As small-scale home gardeners, I assume most of us just take a guess at what our soil needs. Ranchers of course need to be on point in order to not create a surplus and have an adverse effect on their marketable crops. I am pretty spoiled when it comes to knowing ranching contacts. Not necessarily locally, but a majority of my extended family works in different agricultural capacities throughout California. One such family member is my cousin Carter. Technically my 2nd cousin and more like a beloved uncle, Carter has worked as an Agricultural Scientist for years within a company called JMLord Incorporated. One of their specialties, aside from agricultural engineering, is testing soil samples. When you have ghosts, you call the Ghostbusters. When you have soil needs (plus countless other questions on agriculture in general) you call Carter. As a side note, Carter, we really need to make up a catchy jingle for you, since the Ghostbusters have one! We are currently waiting on our soil sample results. Based on the information that comes back from this, we will amend the soil and plan our irrigation and fertilizing lines properly. Stay tuned for our next adventure in permaculture orchard prepping. Will the orange beast and my husband have to take on more worthy adversaries? Only time will tell! 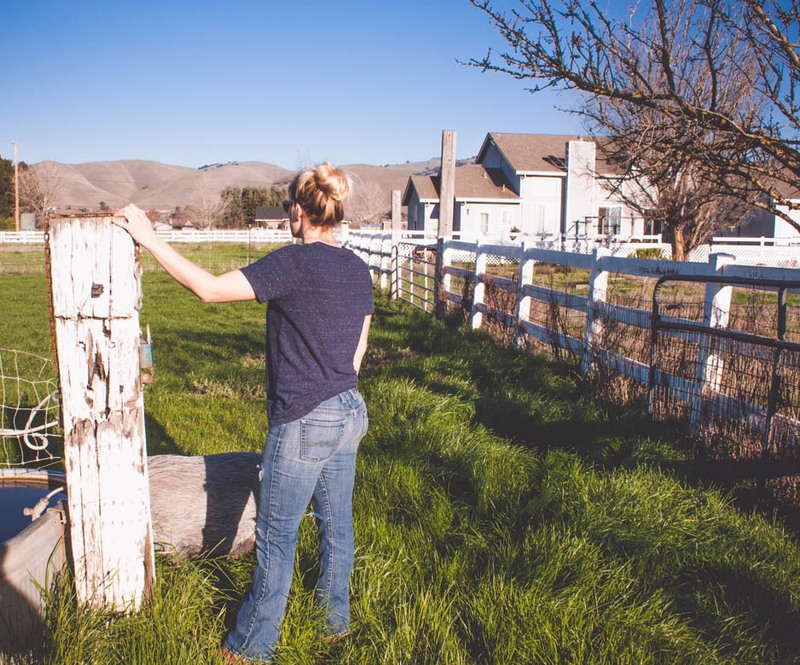 In the meantime, if you have any advice or best practices for orchard prepping or general ranching, we’d love to hear it!